CleO brings to market a family of intelligent, simple to program TFT display boards through which engineers can develop imaginative, compelling human machine interfaces, regardless of their experience level. Using Arduino as a foundation, CleO is able to leverage FTDI Chip’s high speed bridging and display technology so that improved performance and greater functionality can be benefitted from. The CleO family of smart TFT display controllers can be easily programmed to give professional looking HMI/GUI's with no prior knowledge of complex graphics programming or mathematics. There are two module types available - CleO35 and CleO50, featuring 3.5" and 5" smart TFT displays respectively. For CleO35 information, please click here, and click here for CleO50. With extensive tutorials (20 Chapters covering over 80 topics) + 21 DIY projects included to show you how, CleO allows both hobbyists and professionals alike to add a HVGA ( 320 x 480 pixel ) resistive touch TFT display GUI to their Arduino UNO projects. 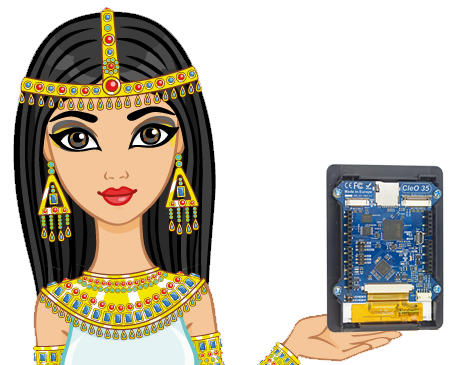 To access the CleO software support suite, please visit www.CleOstuff.com. Smooth animations at up to 60 frames/second. Fast direct file transfers between micro-SD/e-Flash and the Graphics subsystem without using Arduino UNO resources. An extensive range of tutorials (low level examples	designed to train users on accessing all features available with CleO) and projects (which build on the knowledge gained in the	tutorials to build more complex HMIs and may require additional Arduino shields or plug in hardware, such as the CleO camera and speaker accessories) have already been created and are available on our dedicated technical support site for CleO - www.cleostuff.com. The tutorials consist of 20 chapters covering over 80 programming topics in detail, which do not require any specialist graphics or mathematics knowledge to manage. CleO35 CleO35 is a 3.5" smart TFT display shield for Arduino. It includes a 3.5 inch 320x480 pixel TFT LCD panel with resistive touch, and PWM audio output with in-built speaker amplifier for advanced audio quality. CleO50 CleO50 is a 5" smart TFT display shield for Arduino and MikroBUS. It includes a 5.0 inch 800x480 pixel TFT LCD panel with resistive touch, and PWM audio output with in-built speaker amplifier for advanced audio quality. Our energy efficient enhanced Arduino Compatible board delivers >1A current at 5V without overheating. The long pin version supplied allows CleO to be discretely mounted beneath NerO, leaving the Shield headers fully exposed for IO expansion. Adding a baffle/enclosure to a speaker greatly improves the sound/volume of the product. This bespoke version features a 56mm,8ohm 0.5W(RMS)/1W(Peak) internal speaker in an attractive enclosure. A 5M pixel CMOS camera add-on for your CleO projects. This product satisfies the various UK/EU/USA regulations, including the latest energy saving standards and has interchangeable plug tops to allow for global operation. This is an input/output expansion shield for the CleO series. This is an Arduino shield adapter board giving users the flexibility to stack their Arduino board on top of the CleO module. This class 6, 8GB branded Micro-SD card is available for loading all CleO projects and tutorials - details on how to load the files are available via CleOstuff.com. Resistive touch screen pen stylus. © Future Technology Devices International Ltd.